Venezuela has turned into a literal hell on earth. It is on the verge of total collapse. People are starving to death in the streets. Armed militia is everywhere, including the churches. If you try to record anything, you may very well find yourself in a hellish pit of a prison. Journalists have to have a special visa to get in because the government will be watching them… closely. Revolution is in the air everywhere. When people get hungry, they get desperate… and violent. The visage of Hugo Chavez and Nicolas Maduro is everywhere as well. They have now seized all the businesses, the food, the utilities… everything. Along with that there is anti-government messaging all over the place. It’s obvious the people are on the verge of a full-scale revolt. Almost every day, anti-government marches take place across Venezuela. Violence is prevalent. So far, as many as 84 protesters have been killed since daily protests began in late March, as police use water cannons, rubber bullets and smoke bombs to control the situation. 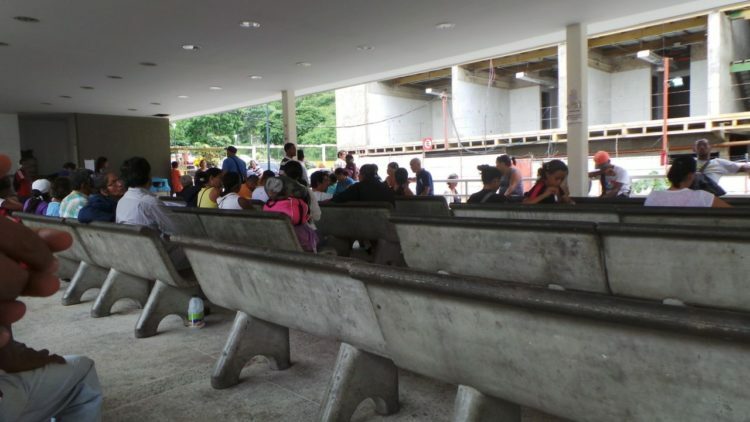 CARACAS, Venezuela – Even at Bogotá airport in Colombia, the closest major capital city to Venezuela, a look of curiosity comes over the faces of staff when you tell them you are heading to Caracas. Entry visas into Venezuela remain fairly accessible, although journalists are not allowed without a special visa. Although I claimed I was there as a tourist, this seemed far-fetched even to the likely pro-government immigration authorities. “What is the real motive of your visit?” the officer asked me. “Seeing my girlfriend,” I replied. 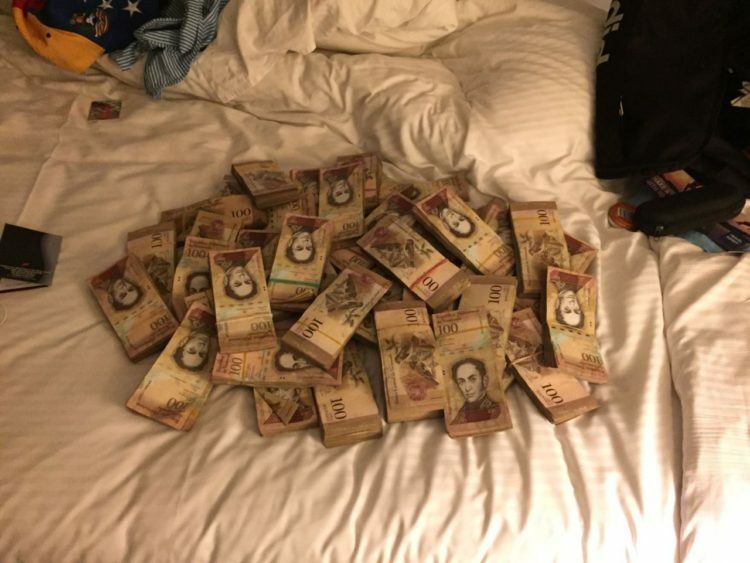 As you travel down from Simon Bolívar International Airport into the city center, the difference between Caracas and Bogotá – formerly one of the world’s major drug war battlegrounds – is stark. Armed police stand on almost every street corner. Every physical space is dedicated to promoting the success of the late Hugo Chávez’s socialist revolution and Nicolás Maduro’s authoritarian regime. 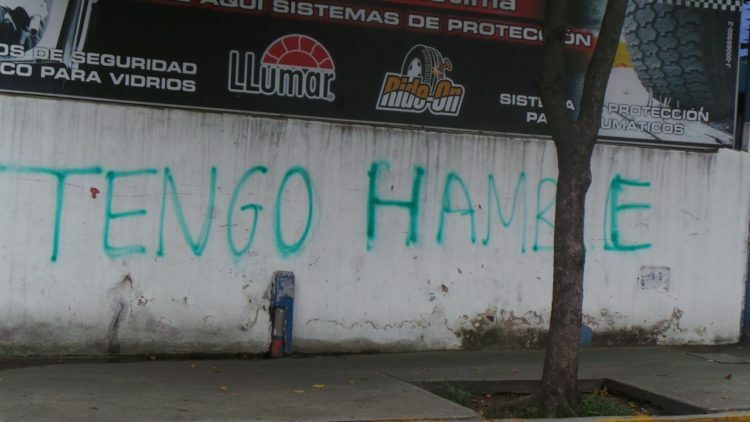 The opposition undermines official government propaganda with its own graffiti, effectively accusing the regime of destroying the country with the highest oil reserves in the world. The rise in anti-government messaging stands out compared to my visit last November. 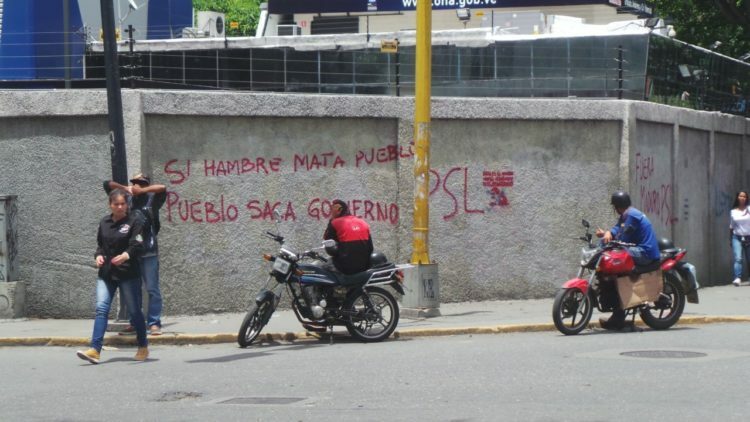 Pro-government propaganda shares the streets with graffiti denouncing the regime on nearly every block. Many people are wearing Venezuela flags and feel a sense of solidarity. Young people gather to confront police. 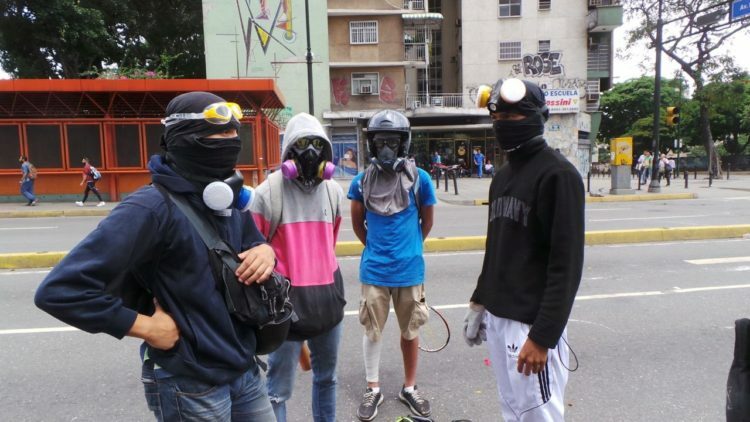 They wear face coverings and gas masks for the conflicts to come. Protest merchandise, including Venezuelan flags, horns and t-shirts are being sold all over the place. There is nationalism afoot and a deep seated anger and hatred of the dictatorship these people suffer under. I wouldn’t even call this socialism… it’s communism and it is brutal. Closer to police and military barriers, the protests become much more tense, with the threat of violence constantly being present. Many of those protesting are boys and young men in their mid-teens. They are fighting age and are willing to give it all to free their country once again. The once heavily attended university there is now more of a ghost town: “The situation is too serious right now for students to dedicate sufficient time to studying,” English professor Lilliana Céspedes relates. “Many prioritize attending anti-government marches or trying to earn money to support their families. 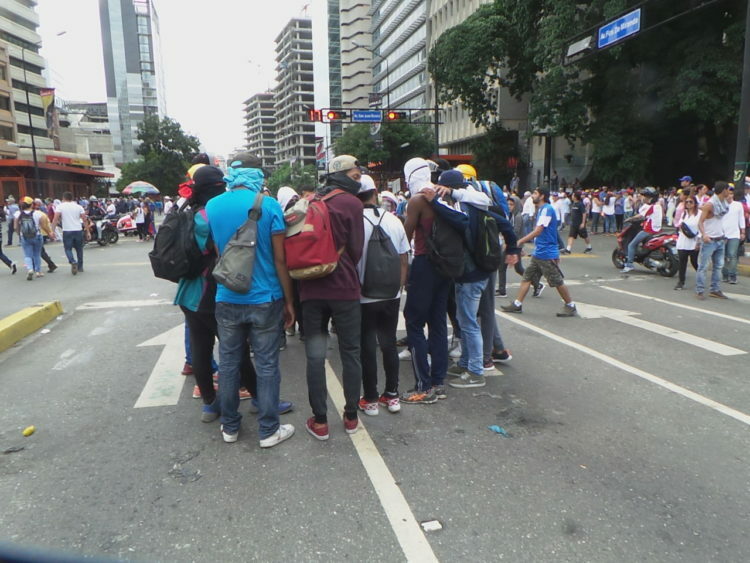 During some of my classes, just a handful of students turn up.” People are more interested in eating and surviving in Venezuela now than things like social justice. There are even police in the grocery stores and hospitals now. People are eating their pets to stay alive. Those with medical conditions are simply dying off. This is what an apocalypse looks like for a country. This right here. Indicators of collapse are everywhere. Whether it is the ongoing violence, the extreme poverty or the enormous piles of garbage in the streets, nothing is working as it should be. In January, inflation reached over 800 percent, while some analysts predicted it could reach 1500 percent by the end of the year. Venezuelans have had it with socialism. Yet, many within the opposition’s leadership structure are members of the Socialist International (SI). Popular Will, the party led by Leopoldo López before his arrest, belongs to the SI. López’s colleagues often find it easier to lay the blame at Maduro’s feet and call for elections, rather than demand a free, capitalist society, rebuilt from the ground up. One student had this to say: “Chávez succeeded in creating an equal society by making everyone poor.” Exactly right… don’t depose one socialist dictator for another. Venezuela needs to rid herself of murderous Marxists once and for all and embrace capitalism once more. A group of young protesters pump themselves up as they prepare to face off with police. Sitting in a hospital waiting room, armed guards soon ask me to put away my camera. Failing to comply would likely mean facing arrest. Thousands of notes are now required to buy anything of value. However, the government recently introduced higher denominations. 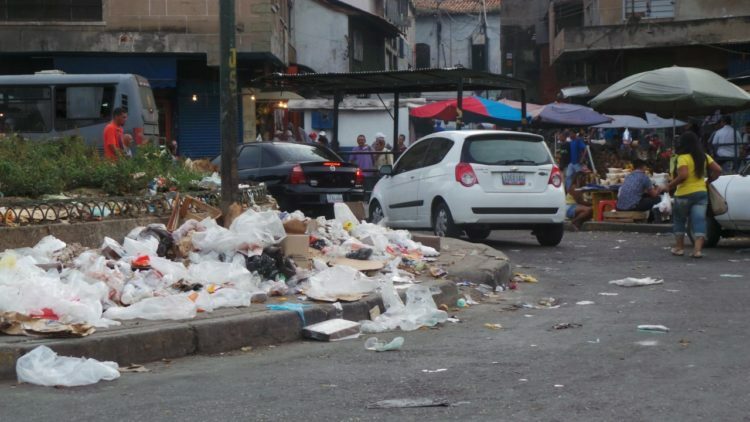 Many streets are covered in landfill. People can be regularly seen searching through garbage for scraps.